can’t process – Hello Korea ! 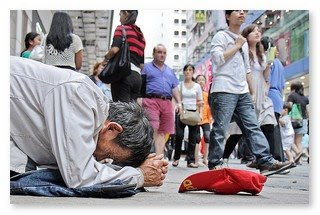 Now, instead of the beggar being on the sidewalk of Hong Kong, place him in Seoul. Now, take away his hat and instead place his arms extended and palms upturned in a cup formation. Now, place the begger at the entrance of a subway station, but not at the opening – no – halfway down the granite steps. And not just perpendicular across multiple steps, no – his upper torso was fully prone, running the length of ONE TREAD. THE most formal of bows, his forehead touching the ground. It was an amazing site, this man bowing the most reverent, supplicant bow in the worst possible conditions, blocking the stairs, a hundred people trying to get around him, totally silent but for his outstretched hands and what they were saying. I could have taken a photo. I should have taken a photo. I should have fought the crowd and put some money in his hands. I should have turned around. But I couldn’t have taken a photo without giving him money, and I wouldn’t have given him money without feeling guilty for wanting to photograph him. And as I was debating this, my legs were still carrying me forward and deeper into the subway system. I don’t know. There are quite a lot of homeless in Seoul, inhabiting the subway system and riding the subways. I don’t know what kind of programs there are if any to help them. I don’t know if, like in the United States, they are the released mentally ill who can’t afford their medications and being institutionalized. I want to find out and do something about it, but more than anytime in the past my energies are so divided.